For more information on the Chiropodist services offered or to book an appointment contact us by telephone (answer machine if unavailable) or fill in our contact form and we will get back to you shortly. Clinic Location: Alcester Chiropody Podiatry & Sports Massage on the South Warwickshire and Worcestershire border serves it’s surrounding villages and is within easy access from Stratford Upon Avon, Henley in Arden, Bidford on Avon, Evesham, Inkberrow, Flyford Flavell, Cookhill, Redditch and Studley. 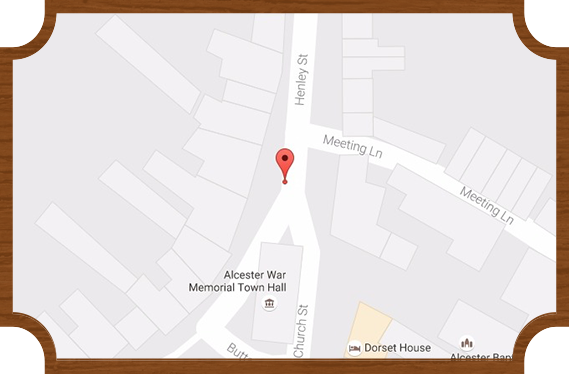 Parking: Alcester has an abundance of free street parking. Bulls Head Yard car park is free. Waitrose car park is free but has some restrictions. Access by foot: From Bulls head Yard or Waitrose car park. Continue down Market Place onto the High St. Turn north towards the church and continue down pedestrian Butter St and into Henley St.